Applications • Drinking Water • Wastewater • Field Use • Industrial Water • Power Carry more water methods with you wherever you need them most. The DR 1900 combines the ruggedness and portability of a field instrument with over 220 of the most commonly tested water methods. Carry Anywhere Make Testing Easier The lightest, most compact portable spectrophotometer available easily goes where you need to go. Simple, easy-to-use interface plus the widest range of vial sizes makes testing flexible. 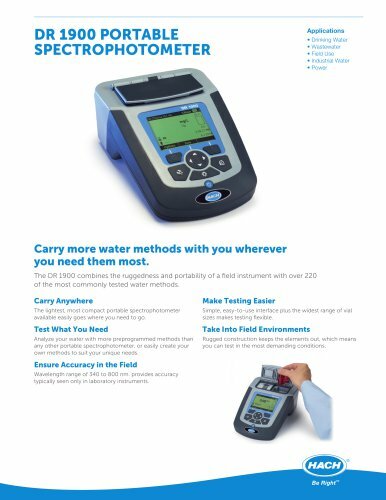 Test What You Need Take Into Field Environments Analyze your water with more preprogrammed methods than any other portable spectrophotometer, or easily create your own methods to suit your unique needs. Rugged construction keeps the elements out, which means you can test in the most demanding conditions. Ensure Accuracy in the Field Wavelength range of 340 to 800 nm. provides accuracy typically seen only in laboratory instruments.